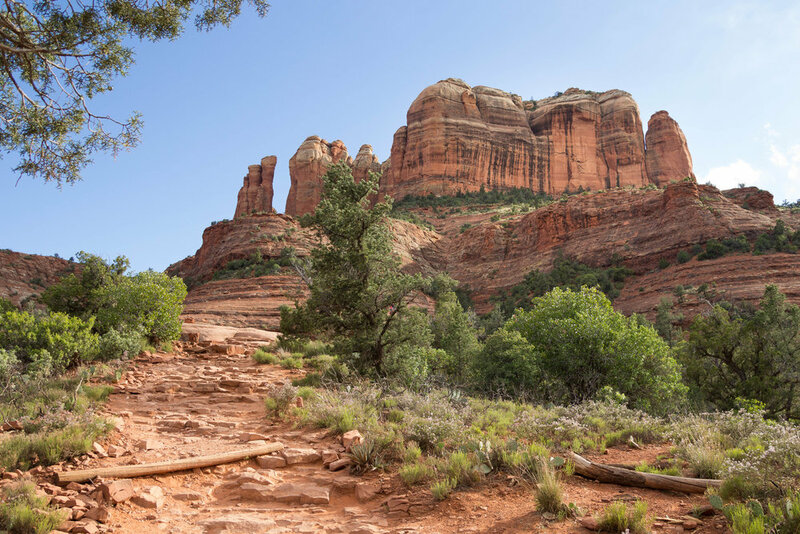 Set amongst towering red sandstone rocks, Sedona is an unforgettable destination for outdoor enthusiasts. The city is serviced by a small airport, so many people drive in from Phoenix (two hours south) and Flagstaff (one hour north), or tag it on to a road trip through other noteworthy northern Arizona destinations such as the Grand Canyon, Antelope Canyon and Monument Valley. Tip: For each hike, we recommend completing them early in the morning (before 9am) or in the mid-to-late afternoon to avoid the heat of the day and escape the crowds. We noticed most people started their hikes around 9am, so hiking on either side will ensure you get a parking spot as trailhead lots are small. 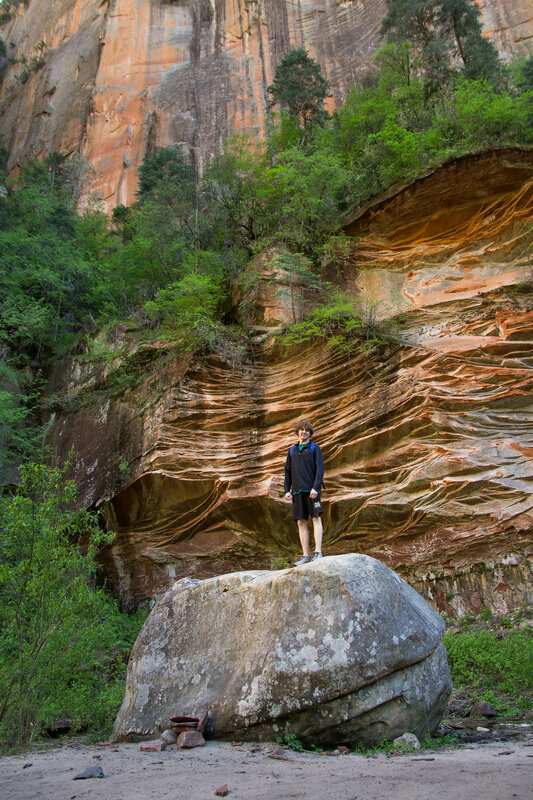 In addition, the softer light in the early and later hours of the day brings out vivid colour in the sandstone formations. This trail offers an exhilarating climb to a saddle between the rock spires of Cathedral Rock Butte. Though the trail is marked with large rock cairns the entire way, the upper portion requires some scrambling up bare rock. Shoes with good traction are a must and extra precaution should be taken if conditions are wet. Signs at the trailhead appropriately indicate you should only climb as high as you feel comfortable. If you’re hiking with children, we recommend stopping partway up as there are very steep drop-offs at the top. Luckily, the entire climb affords incredible views over Sedona and nearby Courthouse Butte. Living up to it's name, Devil's Bridge is a stunning natural rock arch set hauntingly high above the valley below. The trail starts down a 4x4 backcountry road eventually reaching a footpath that leads up a short climb to the arch. The first section along the road is fairly unmemorable asides from watching passing jeep tours clamber up and down the rocky road. A more scenic ‘Chuckwagon’ trail can be taken as a different option to the Devil’s Bridge footpath, however this requires parking at the nearby Mescal trailhead and adds half a mile to the total length. The footpath to the top of the arch starts with a gentle incline and finishes with stepping stone stairs, some which are moderately steep. Along the way up there are some nice overlooks so be sure to stop and admire the view. Note: If you chose to walk out on the arch, extreme caution must be taken as there have been fatalities from hikers falling off of the bridge. 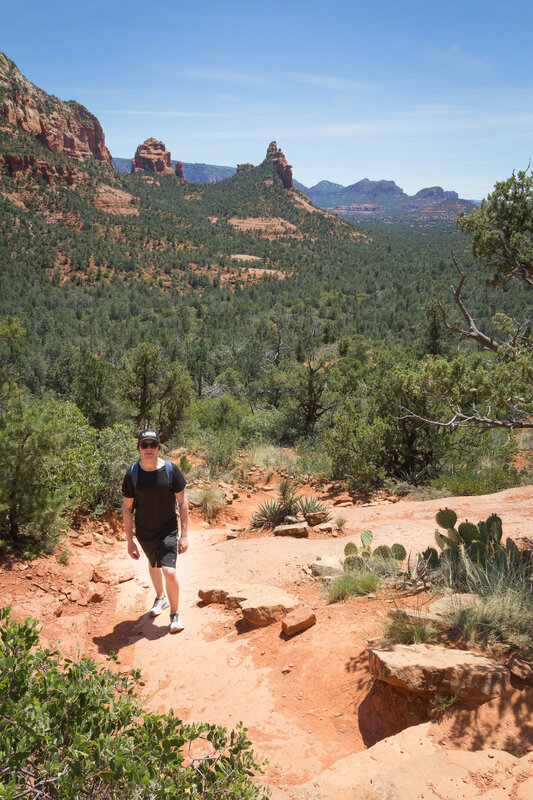 Located 7 miles north of Sedona, the West Fork Trail offers an escape from the hot sun as it meanders beneath a treed oasis along the soaring Oak Creek Canyon walls. With a limited (and very gradual) elevation gain and 13 crossings of a shallow creek via stepping stones, this is a perfect hike for families looking for an opportunity to explore the lush canyon. The trail can be completed as far as your party chooses, though we found views of the canyon walls became more dramatic the further along into the canyon we went. Minutes into the hike, you pass the foundation of a cabin-turned-lodge that welcomed travellers to the canyon from 1926 to 1968. Many prominent guests stayed here including Clark Gable and Walt Disney who enjoyed exploring the canyon before it became an official trail. Author Zane Grey also wrote ‘The Call of the Canyon’ while staying at this lodge. A little more than 3 miles into the hike, you arrive at an unremarkable point where a sign notifies the trail’s end and gives way to the stream. Depending on water levels, you may be able to explore another 5-10 minutes past the sign if you choose, however there is no remarkable finale here either. The beauty of West Fork is in the trail itself, not the finish. Entrance to the trailhead costs $10 per vehicle, or $2 for walk-ups. There is some parking on the side of the highway approximately 2 minutes north of the entrance lot, however precaution must be taken when walking along the road as the shoulder is narrow. Due to the popularity of this trail, we highly recommend starting this hike in the mid-afternoon as, especially on weekends, it can be extremely packed during peak hiking hours. The astonishing thing about Soldier Pass is that the trailhead is minutes from the town center but gives the feeling of a backcountry hike. The trail winds between Brins Ridge and Capitol Butte (aka Thunder Mountain) and climbs up to Brins Mesa with stunning views looking back. 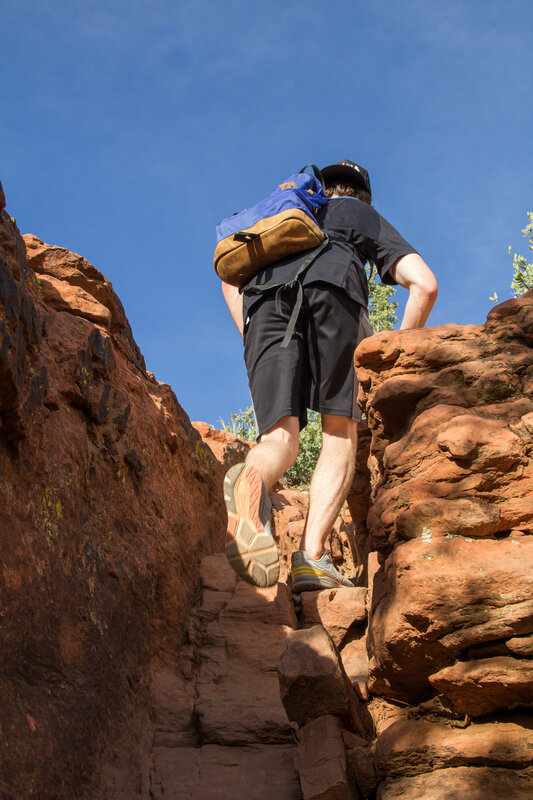 The hike can be completed as an in-and-out, however we highly recommend combining it with the Cibola Pass (slightly shorter) or Jordan Trail (slightly longer) connecting trails to complete a loop. Take note that the direction that you complete this loop is very important for obtaining stunning views. 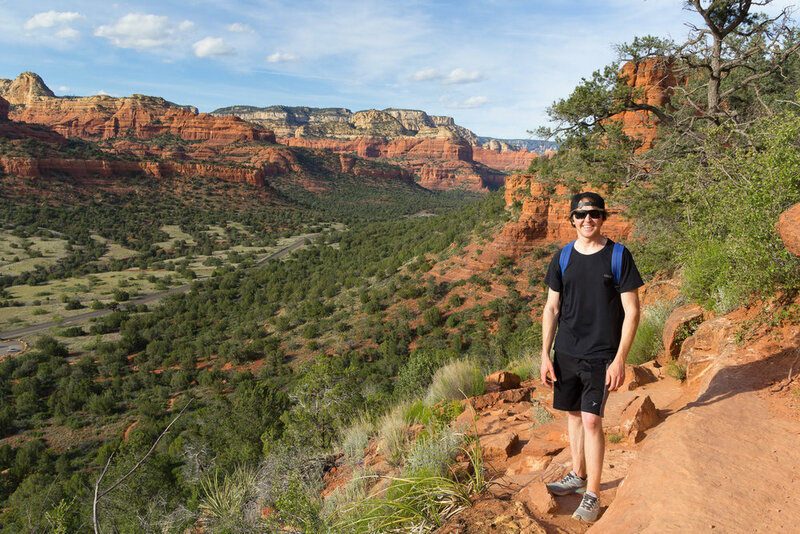 We recommend starting at the Soldier Pass parking lot, then hiking the loop in a clockwise direction as the views over Sedona become significantly more impressive on the way down from Brins Mesa to the Cibola connector. Note: There are no washrooms at this trailhead, and parking is very limited (14 spots) so you will likely have more luck finding a parking spot by starting this hike in the afternoon. At the time this post was written, we were able to park on a nearby residential street (Rim Shadows Drive) because it was the only street without 'no parking’ signs. Doe Mountain is a short climb up to the top of a mesa where hikers can explore at leisure to take in 360 degree views of Sedona, Oak Creek and Dry Basin. The climb up to the top of Doe Mountain is steep and at times narrow, but is made easier with four gradual switchbacks and stunning vistas to distract you from the effort. Because of it’s impressive views gained with a short effort time, we highly recommend this hike for sunrise/sunset. 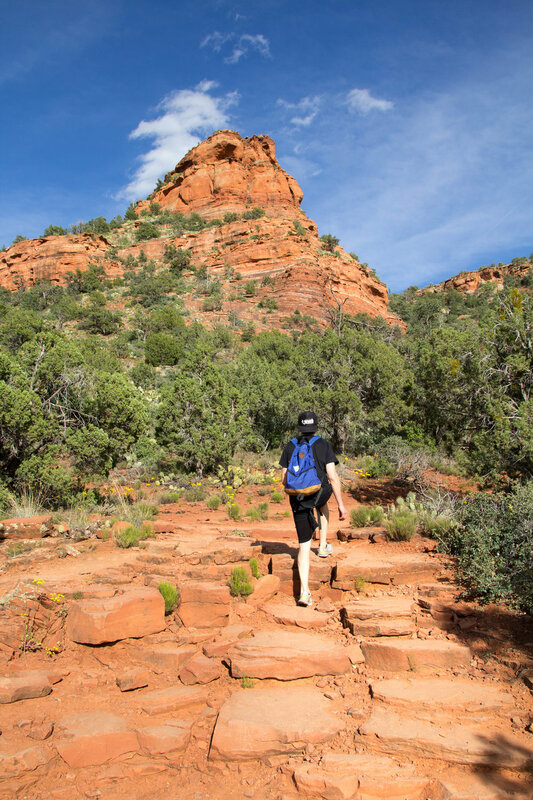 Although this list could be much longer, we felt these five hikes provide an unforgettable and varied opportunity to explore the red rocks of Sedona. Did we miss any must-do's? Please feel free to add your helpful suggestions in the comments below! Note: Although some of these trails are short, hiking in the desert environment means there is little shade and requires certain safety precautions to avoid heat-related illness. Always bring plenty of water and salty snacks, and wear a hat and sunscreen to protect yourself from the sun.